This <em>art supplies for children</em> exposes them to the need to use renewable energy to provide environmental solutions. 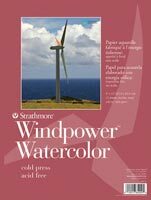 This paper is made with 100% wind power – a pollution free, renewable energy resource – perfect for the environmentally conscientious artist. It's a great addition for <b>children's art kits</b>. Made with care and specifications include natural white, 140lb., cold press paper that is suitable for all wet media techniques using watercolor, gouache and acrylic. Acid-free with good wash and lifting properties, it is ideal for artists mastering watercolor techniques and for accomplished artists. The pads have 15 wire-bound sheets. An esssential item for Chicago art supply stores.